Living in the desert we don't get a lot of blustery cold days where we can find comfort in a warm bowl of soup or stew. So when the temperatures this weekend suddenly dropped to the low 60's and it started to rain we decided to take advantage of the situation and make some veal stew. I found the recipe below in the January edition of La Cucina Italiana magazine. It was easy to put together and delicious. Exactly what we needed this weekend: comfort in a bowl. I'm submitting this recipe to Magazine Mondays over at Cream Puffs In Venice. Heat 1 tablespoon oil in a large pot or Dutch oven over medium-high heat. Add half of the veal and cook, turning, until browned all over, about 7 minutes. Transfer veal to a plate. Repeat with remaining oil and veal. Pour off the oil. Melt 2 tablespoons butter in pot over medium heat; add potatoes, carrots, onion, zucchini, celery, 1 teaspoon rosemary, peppercorns and salt. Cook, stirring occasionally, for 5 minutes. Add veal and any accumulated juices back to pot. Add stock and water; bring to a simmer. Cover, reduce heat to low, and gently simmer until meat is tender, about 1 hour. occasionally, until reduced to about 2 cups, about 15 minutes. Return vegetables and veal to pot; stir in remaining teaspoon rosemary. Heat to warm through. Yum, I saw that recipe!! :) Enjoy your cool days!! I love making (and scoffing) veal spezzatino! I like this rendition, very delciate. Hey, if you're a cornmeal fan, I've updated the Polenta series, care to taste THREE more toppings? Let's make a deal. I will try to send more cold weather your way so you can eat more soups and stews. And I will take some of your warm, dry weather so that I can stop having to wear fifty layers of clothing. Sound good? This looks amazing! I love veal. And polenta. What a wonderful stew. It looks hearty and delicious! I wish that I were eating it in the desert right now! We are expecting another big storm on Thursday -this winter cannot end soon enough for me! There's nothing like a warm and hearty, stick-to-your ribs stew to warm you body and soul. I could use some right now - with a giant storm yesterday and another breathing down our necks tonight. OK, that stew looks amazing. I am going to have to get some more local veal and try it. I just need a spoon to start digging in! Gorgeous! Like you I don't have cold weather here in the Caribbean. 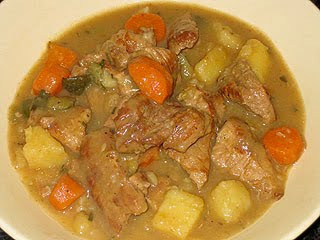 This is the kind of hearty stew that I'd enjoy even a warm day.